Delivering a confident proposal speech can be intimidating. How do you know what to include to get your audience to see the potential in your idea? Whether your goal is to convince the love of your life to marry you, persuade an investor to finance your business, or receive grant funding for a research project, studying successful proposal speech examples can give you a proposal model to follow when creating your own speech. On this page, you’ll find a range of proposal samples as well as tips for creating a proposal your audience can’t refuse. Start by brainstorming: Free write all of the things that come to mind when you think of your topic, whether it’s why you want to marry the one you’re with or why a certain research topic is so important to you. 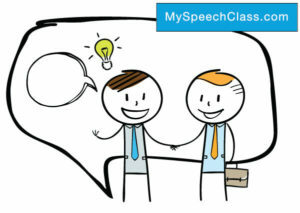 This activity will help you identify what you want to include in your speech. Cater to your audience: Speak to the needs and desires of your audience. Whether it’s the person you love or a group of people you’re prospecting to, feed into their own wants and passions. Form a proposal outline: You might not need to write out the entire speech for a wedding proposal, but forming a proposal outline will help you recall the points you want to make. Speak with enthusiasm: Your honest and genuine emotions can be a big part of a persuasive speech, ultimately convincing your audience to say yes. Practice: The more you practice and prepare for your speech, the more confident and persuasive your delivery will be. The tips above are helpful with any type of proposal, but to best prepare for your specific proposal speech be sure to check out the examples below. Business plans, research papers, marriage proposals, and more – proposal speeches at large are used to put forward a plan for consideration. Along with the guidelines above, use the examples below as a guide to help craft your specific proposal speech. This sample speech is a good example of how to propose a new idea to the leaders in your company. The speaker uses persuasive speech to convince his business leaders that hosting Toastmaster meetings at their facility will be a good idea. He proves his point by asking questions and getting the audience to think about the overall goals of the company, then demonstrating how his proposal matches those goals. This research proposal asks the government of Canada to fund a study that will reveal the best diet for Canadians to promote fat loss and prevent future obesity. The speaker emphasizes the trickle effect of adults’ efforts being passed down from generation to generation by educating the youth on benefits and importance of healthy eating. He delivers striking facts that are sure to hit his audience’s pain points. In this business proposal speech example, a professor delivers a business plan for the fictitious company JobEx. This is a good example for forming your own outline of a business plan proposal speech. Note that the professor starts with the vision and mission for his company, shows how industry needs make his business viable, and describes his business strategy as well as the target audience he’ll serve. In his proposal to host a bounce house, food truck, and raffle extravaganza, the speaker offers a clear thesis statement. He states his goals for the event, all of the necessary details, who will organize it, and who the target audience is. He also explains how he’ll advertise as well as his strategy for getting good prices from advertisers. Use this example to form your own checklist in your event proposal. This communication student pitches his idea for an informative speech topic, titled “What Do I Have in My Camera Bag?” He explains how the speech topic can help other photographers in a number of ways and outlines the sources of information he’ll use. This is also a good example to use for research proposals, a thesis paper or problem-solution essay. This TEDx talk is an excellent persuasive speech sample that can help you form your own proposal speech on a serious topic. Dr. Van Horn offers cost-effective solutions to end long-term unemployment in the United States. You don’t have to get on the Steve Harvey show, but you can take some pointers from this excellent wedding proposal speech. This man has the good idea to turn a birthday speech to his girlfriend into a group song, and finally, into a marriage proposal. The birthday speech is a good ploy, because when the speech goes another way, it catches the woman completely off guard. This allows the man to say all the quality things he wants to say about her while she’s paying attention. This gentleman has no idea how to put his proposal into words. After getting some help creating his marriage proposal, he then delivers his promise as a husband and has some cute kids help him pop the question. This video is a great example of how to overcome writer’s block when creating a proposal speech. This guy does a great job of keeping his speech short and sweet, then teases his fiance-to-be with a game: Where’s the ring? When you want to add a touch of humor to your proposal speech, this is an excellent example. Cite this article as: Jim Peterson, "Proposal Speech [Tips + 10 Examples]," in My Speech Class, May 13, 2018, http://www.myspeechclass.com/proposal-speech.html.